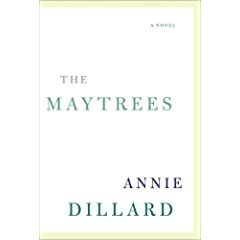 Last night I finished reading The Maytrees by Annie Dillard. The book was rather short and an easy read. I was intially inspired to read this book because of a review that I read on NPR. Here's the link http://www.npr.org/templates/story/story.php?storyId=12241185. At times I found that Dillard was trying too much in her use of analogies. She throws in periodic medical terms that are unnecessary and confusing. However, her images of the sea and love were poetic and touching. The story itself I found to be rather dull and typical. Themes of betrayal, forgiveness and family were commonly connected and undone. I did not find myself drawn to the characters or feeling for their pain or suffering. In fact near the end of the book I was tempted to read the ending (which I did and never usually do). I did end up going back and reading what I missed...but by than most of the thrill was gone. Since the book is only 215 pages if you have some extra time you might want to give this book a read, otherwise, save your time and mind for a book with more of a plot and better use of vocabulary!